I made this drawing at the British Museum in 1991. Part of a series, it represents the struggle between civilized Apollonian creative urges and the wild Dionysian aspect of making. I used a sheet of 100% cotton rag, hot-pressed paper from Falkiner Fine Papers in Southampton Row – the shop has now moved to Gillingham Street in Victoria, London. I think the paper was Fabriano Artistico, a heavy, strong make – nearly £10 per sheet. I stretched this on plywood and then worked at the surface without reference to anything – automatically. Initially the surface was covered with crazy marks, made with graphite sticks and soft pencils. I added powdered graphite to this and scrubbed the surface with a wire brush. Then I completely obliterated all the white of the paper so the drawing had a dull, leaden sheen. I tipped concentrated household bleach (sodium hypochlorite) on to this. Then I washed all the loose graphite from the work under a running tap. This left ‘an abused surface’ – scarred, with lots of wild, ghostly suggestions of the madness which had produced it. At the time, I didn’t know what to do next – so I left it a few weeks before taking the drawing to the British Museum. I settled on one of the relief sculptures from the Elgin Marbles (Metopes from the Parthenon). 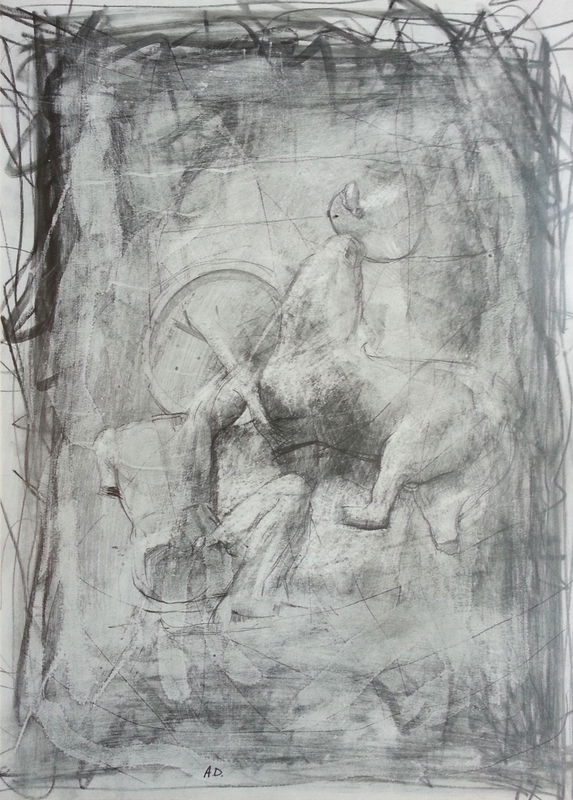 I wanted the imposing calm of early Greek statuary to balance the disturbed, aimlessness of automatic drawing. I worked for a few hours with a soft pencil and scalpel, scratching into the cotton rag paper to bring up it’s whiteness for the highlights. The result is a graphic account of the two extremes of creative making – Wikipedia states ‘the battle between Lapiths and Centaurs took on aspects of the interior struggle between civilized and wild behaviour, made concrete in the Lapiths’ understanding of the right use of god-given wine, which must be tempered with water and not drunk to excess.’ – an interesting aside. The centaur raises a vase or pitcher above it’s head as if to strike the lapith with a shield beneath. Perhaps the pitcher had been full of wine. It was intriguing to re-visit classical statuary after having been surrounded by it at the Royal Academy Schools with it’s famous corridor; I made drawings from the casts whilst I was there. The above work is approximately 20 inches by 16 inches.